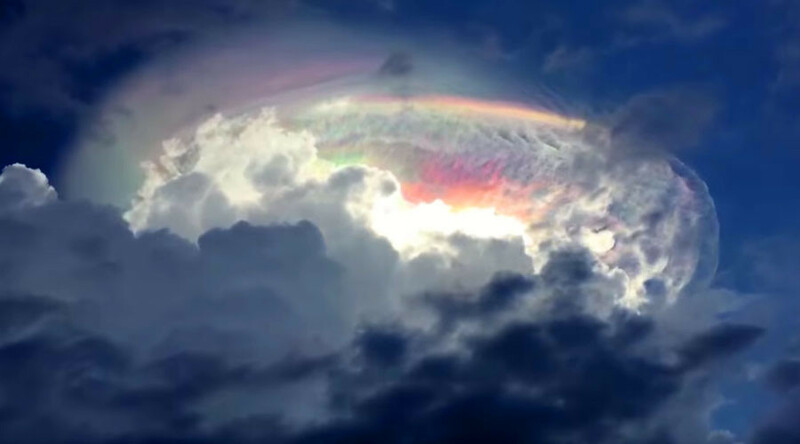 A stunning unusual phenomenon colored the clouds of Costa Rica's sky into a rainbow type earlier this week, stimulating intense online debate between atheists and creationists as to the source of the spectacular sight. A cartoon-like stunning rainbow cloud appeared, and if it weren’t for YouTube videos that viewers posted, one may think it was PhotoShopped, as the gorgeousness of the phenomenon appears idealistic. Scientists call the effect ‘cloud iridescence’ and it’s initiated by diffraction when small water or ice particles separately scatter light. Cloud iridescence is rare enough to surprise countless people all over the world when they first see it with their own eyes, as social media proves. You might have heard about it by now but the only science behind this is Cloud iridescence.